To kick off the 2014 fly fishing season, Finn Utility has announced two new additions to their product catalog as well as an updated website design that includes photography of Russell Schnitzer. As winter’s fleeting grip dumps masses of snow on New England, the underlying currents of spring rise inside us all. The sun’s power will soon melt the ice and clear the way for…..fly fishing ! Please check out the latest updates to our website: featuring a collaboration with the gifted photographer Russell Schnitzer who provided us with some amazing shots. Thank you Russell! 1. Akkord Spey Head Wallet. Designed to roll up and move out, whether you’re getting lost in the woods, escaping to your cabin, or floating to your secret spot on the river, the Averill Rucksack is grounded in function and simplicity. This spiffy looking piece is carefully crafted from a comfortable and reliable combination of water resistant waxed 18oz. twill canvas, premium wool felt, and rich oiled leather. Details include four strategically placed lash tabs; two on the bottom to hold your heavier items and two on each side to secure your fly rod tubes. It keeps your gear neatly organized with two side pockets, one with a removable felted wool laptop sleeve that doubles as a back cushion, and a smaller top pocket for your keys, phone, or favorite Opinel knife. 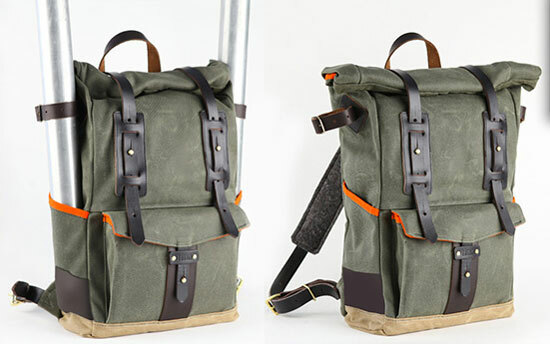 External pockets include a large gusseted front pocket with Finn post closure and two side pockets, felt-padded shoulder straps and convenient leather handle loop on top. Everything is carefully secured with rivets, stitches, and buckles. Not w ithout adventure, this will be a coveted bag.